Liz Miller: While pattern and repetition are obviously part of your work, I would not necessarily characterize your work as decorative. Tell me a little bit about how pattern/repetition/decoration figure into your work. Surabhi Ghosh: This is huge—I could (and do) speak for a long time about this! Everything I’ve ever made can be broken down into two components and the relationship between them: patterning and storytelling. Visual patterning is a language with an extensive vocabulary and a complex organizational structure. Patterns tell stories, if one is interested in listening. I’ve spent several years studying pattern and creating patterns. In some pieces, I emphasize the “repetition” behind pattern more than visual pattern itself. But pattern and repetition are always part of my work. The word “decorative” is loaded with multiple meanings and cultural connotations, some of which are contradictory, which is what makes it worth grappling with. My choice to use that word comes from an urge to acknowledge it and claim it as a powerful visual language that often speaks “from the margins”—and to claim the periphery as a significant place for speaking and listening. My larger interest here is in the demarginalization of narratives that “trouble” the dominant ones. What does it mean to do this in the western contemporary art context? For me it started by paying attention to the qualifiers we use—fine art versus folk art or decorative art; contemporary art versus traditional art; primitive art, textile art, etc.—and acknowledging that these words indicate a hierarchical value system. An alternative model is one where all makers and forms are equally valid. Decorative patterning is full of meaning; textiles are full of meaning; the margins and edges of spaces (cultural spaces, institutional spaces, art spaces, etc.) are important. Liz Miller: Your installations are also minimal—they seem as much about absence as presence, and as much about deconstruction as construction. There is a concision and specificity that I find really appealing. Can you speak a bit about your work’s relationship to minimalism? Surabhi Ghosh: Yes! I’m thrilled that you picked up on some of the (seemingly) oppositional ideas that I am most drawn to, especially when I make aesthetic decisions. These ideas aren’t opposites or contradictions. They are interdependent concepts—things we define and understand in relation to each other. Minimal and decorative might be another pair. What I find myself doing more and more with each piece is searching for conflicting ideas and then trying to figure out if they can both stay, if I can find the exact right amount of tension for the whole thing to hold together and survive, both physically and conceptually. Usually something fails, and that’s how I find my way to the next piece. One of my recurring questions is: How can I make a piece with precision and specificity that is also unbounded and sprawling? For example, if I make an exact one-inch incision every inch along the width of a bolt of a sturdy, functional material like upholstery vinyl, what messy chaos spills out from the process, or the resulting form, or observations from others? The minimal intervention, the controlled mark making, the measured repetition, all of these formal devices hopefully make way for their apparent opposite: a loud messy pile of chaos. The work of some my favorite artists can be categorized as minimalist or post-minimalist, and I’m definitely building on these aesthetic and conceptual foundations. For example, here are a few artists that provided me with some “ah ha!” moments: Fred Sandback (a material line in space), Eva Hesse (difference in repetition through material behavior), Robert Morris (draped lines and planes), Anish Kapoor (curved forms and non-reflective color), Tara Donovan (transformation through repetition), Richard Serra (“Drawing is a verb”), Robert Irwin (subjectivity of perception), Yayoi Kusama (repetition and reflection) and most importantly, Felix Gonzalez-Torres, who I’m pretty sure figured out everything that I’m trying to figure out and much more (saying so much with so little; an unbounded concision; meaning is not fixed and is made by all of us together; identifying the point where critical analysis and emotion meet [our bodies]). I also had the privilege of working with three incredible artist-mentors who taught me more than I can explain, and whose works also relate to post-minimalism: Jane Lackey, Joan Livingstone, and Anne Wilson. But I also grew up in a household full of South Asian visual art, especially textile-based objects. For me, these were (and continue to be) equally important sources to learn from. The “everyday” or the familiar—the objects, materials, and visual information we come across in our daily lives—is as significant to me as the canon, no matter how inclusive you make it. Liz Miller: You have a background in fibers and teach fibers at the university level. In your own work, you utilize traditional techniques as well as much more experimental approaches. 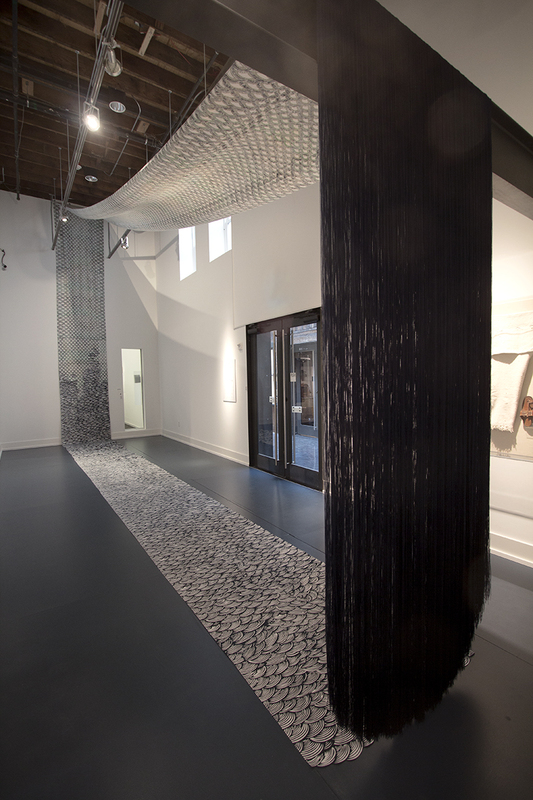 How do fibers, textiles, and related processes figure into your practice? Surabhi Ghosh: Another huge question! I’ll start by referring back to your first question: pattern and repetition are an intrinsic part of textiles, part of every single step of the creation of cloth, from spinning to plying to warping to weaving. My specialty in fibers is printed textiles, which has a heavy emphasis on patterning. I make choices about which processes to use for a project depending on my subject matter and my conceptual goals. My largest installation piece so far, titled A hair’s breadth, the unfurled sea, was made using traditional processes in non-traditional ways. For example, the blue “hair” section is actually unwoven sections of warp yarns—the woven section is hidden on top of the beam. It had to be partially woven to hold the hundreds of strands of yarn together in an orderly manner, as well as to have a solid portion I could mount onto the beam. We tested many different ideas in the studio, and hand-weaving on a floor loom was the simplest way to get what I needed for the piece. My parents were immigrants to the US. I have a large extended family around the world, and I was brought up as part of various South Asian communities. My parents were proud of their roots, and they really missed their homes and families in India. My family wanted me to learn about “our culture” and taught me about art, music, dance, and literature. I always tell people how “general knowledge” of textiles is much more extensive in India than in North America. Growing up, I loved to watch my mom putting on a sari for a dinner party; I loved watching the 6 meters of fabric start as a pile on the ground and end up neatly pleated and tucked around her body. As she dressed, she’d tell me all about the sari—this is a cotton-silk blend, it was made in this specific small town in Gujarat, the pattern is woven on the border but printed on this other part, the motif is from a peacock feather or maybe a mango, they call it a paisley over here but that’s not an Indian word, this was a gift from your aunt at so-and-so’s wedding, it was a very nice gift, it probably cost 500 rupees, which is less than 10 dollars over here, and so on. So, while she was getting dressed, my mom taught me about material, technique, pattern and motif, geography, colonial history, family, and economics! And it was all embedded in one piece of cloth. This is the field of Fibers, and my approach to teaching Fibers and making art. Going to art school was productively problematic for me—confirming that much of what I valued was not considered “real art,” while also learning that artists have been challenging that taxonomy all along. I had some great professors, some great friends, and, also, the fibers department. Fibers is a place to challenge everything, including art. In a university context, it’s a place for critical analysis of material, culture, history, global economics, colonialism, and normative identities. 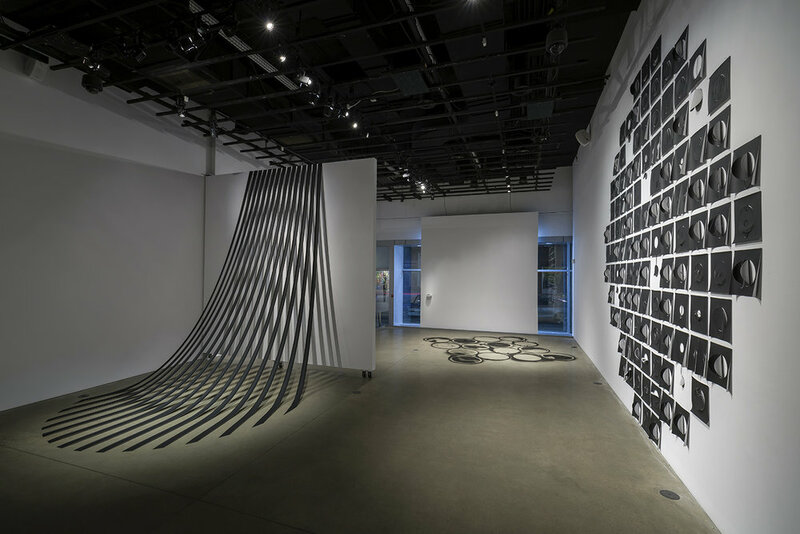 In the North American context, where we are still bogged down by old-fashioned notions of gendered labor, fibers is connected to “women’s work”—what this means today, at least for me, is that contemporary fibers provides a highly productive and supportive space for intersectional feminist critique in a studio arts context. Another reason I use textiles is that cloth is unruly; it fights against our attempts to control it. Cloth behaves however it will; it collaborates with gravity (it sags, droops, and drapes), with air (it waves, flutters, and inflates), with light (it filters or blocks), with liquids (it absorbs and then dries again). Those of us trained to make and manipulate textiles spend a lot of time trying to control the materials and processes, because the techniques are intended to make functional objects. But what the art context enables us to do is to stop and ask “Why”—that is, why control it? What does the material/process potentially do and say, and how can I collaborate with that in order to speculate on new possible meanings? Liz Miller: Describe a pivotal experience in your life/career and how it impacted your work. Surabhi Ghosh: I find that every big change in my life—moving, a new job, etc.—has an immediate impact on my work. But my most recent move has been the most transformative for sure. After grad school, I lived and worked in Chicago for about seven years, then Eugene, Oregon, for three years. I moved from Oregon to Montreal in 2014. Everything changed! For the second time in just a few years, I said goodbye to a close-knit group of artists and friends and started over from scratch. I didn’t know anyone in Montreal, the immigration process was very challenging, and I definitely didn’t know French. It was destabilizing but also invigorating. I am an immigrant now. Even being the child of two immigrants, I had no idea how difficult it really is. I have a newfound and profound respect for anyone, including my parents, who leaves their home for the protection or opportunity it could provide their families. I did this for an awesome new job, was helped by my employer, and live an hour’s drive away from my home country. I did this in part for “a new experience,” and it turns out its pretty hard. Meanwhile, every day I read news reports about what’s happening at both borders of the US. I’ve been examining my own privileged position in the world, finally addressing for myself what it meant to grow up as a brown woman in the US, and I’ve been rethinking how my art practice fits into things. This has led to a huge shift in my work—I’m talking and writing openly about identity as part of my work for the first time, and I’m feeling extremely unsure about it. But I think it’s time to consider how I might make more meaningful contributions if I’m more honest with myself and with others. This has meant confronting some traumatic experiences for the first time, and acknowledging that psychological self-preservation is a valid reason, but it’s not a good excuse anymore. Surabhi Ghosh: I am working on a new body of work that builds on a 2017 piece called Garlanding & Guise, made for the SPACE Gallery window last summer. This work comes out of investigating the invention of nationalist ideologies, how those shifting narratives are transmitted to people over time and space, and how those narratives reinforce oppressive roles for women. I’m responding to the rise of nationalism and the rhetoric of “populism” in the US and in India, the two countries of my “origin” (of course this a highly alarming global trend, and Canada is not exempt by any means). I’m working with the form of the “garland” as a particularly loaded ritual object and symbol of devotion in religious contexts (like a Hindu wedding ceremony) as well as being wielded as part of political spectacles in the current political context in India, now controlled by a far-right Hindu nationalist party (Modi’s BJP). I’m linking garlands, jewelry, and armor in their functions as symbolic, decorative, and protective objects—but they also function as guises, ruses, objects that trick us into becoming devotees, objects that hide ugly truths and present fictitious outward-facing narratives to observers. I’m presenting a paper titled “Carrying Cloth: Materials, Migration and Mediated Identity” at the Textile Society of America symposium in Vancouver in September 2018. My next research trip will take me to Trinidad and Tobago in December, where I hope to learn more about the South Asian diaspora in the Caribbean. I’ll be showing my new work in a two-person show (titled Margins, Material, and Metaphor) with the amazing artist Olivia Valentine at Heaven Gallery in Chicago in March–April 2019. I’m also working towards a publication project, and I will continue collaborating with artist and colleague Sarah Nance on our ongoing series of sand drawings. Liz Miller: I know that artists are only supposed to make art and do artsy things, but I’m always curious about artists’ interests outside of art. What are you doing when you’re not in the studio? Surabhi Ghosh: I am in the studio as much as possible! But I’m also a teacher, and I’ve been running the Fibres & Material Practices program at Concordia for three years, so a big chunk of my time is spent on that, which is a real pleasure and an honor, even if I wish I had more studio time during the school year. But right now it’s summer, and I’m in the studio every day! Outside of art and work, I spend as much time as possible with my amazing partner Rob. This summer, we wander around Montreal, cook and consume delicious food and drink, watch films, listen to music, read . . . we also collaborate on publication projects and are just starting to work on a new book. We spend a ridiculous amount of time doting on our kitty Rafi. My mom lives in California and my sister lives in Switzerland, so I spend time keeping in touch with them, and we are always planning our next get-together. I also spend time talking about how I should do more exercise. 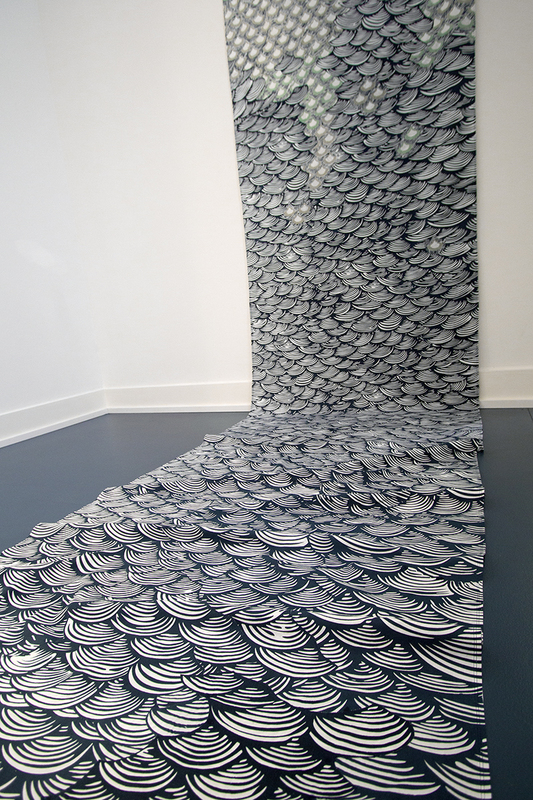 Surabhi Ghosh is an artist and educator based in Montreal, Quebec. 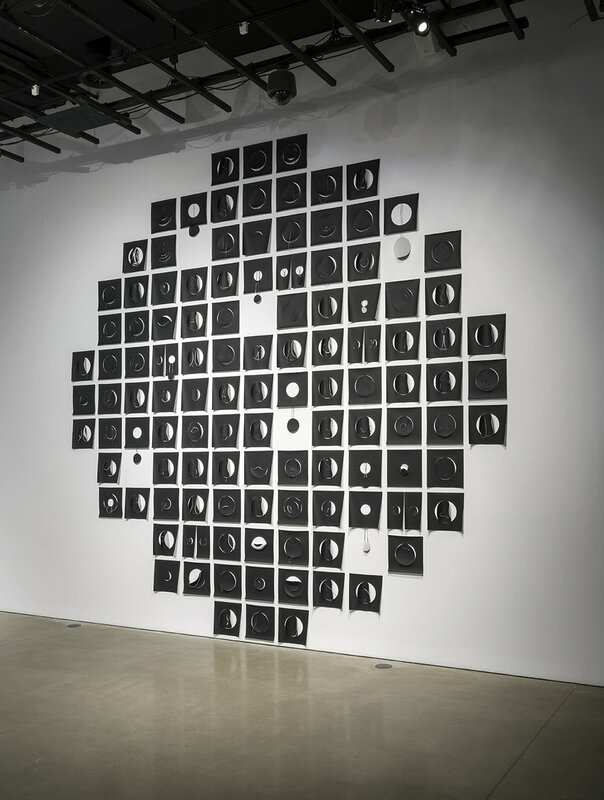 Her current work investigates the transmission of culture to diasporic people, specifically South Asian immigrants and their descendants in North America. She uses textiles, patterns, and site-responsive installations to materialize contradictory narratives which begin and end in her own experiences. Recently, her work has been exhibited at the Wing Luke Museum in Seattle, FOFA Gallery in Montreal, SPACE Gallery in Portland, ME, Duke Hall Gallery in Harrisonburg, VA, and Ditch Projects in Springfield, OR. 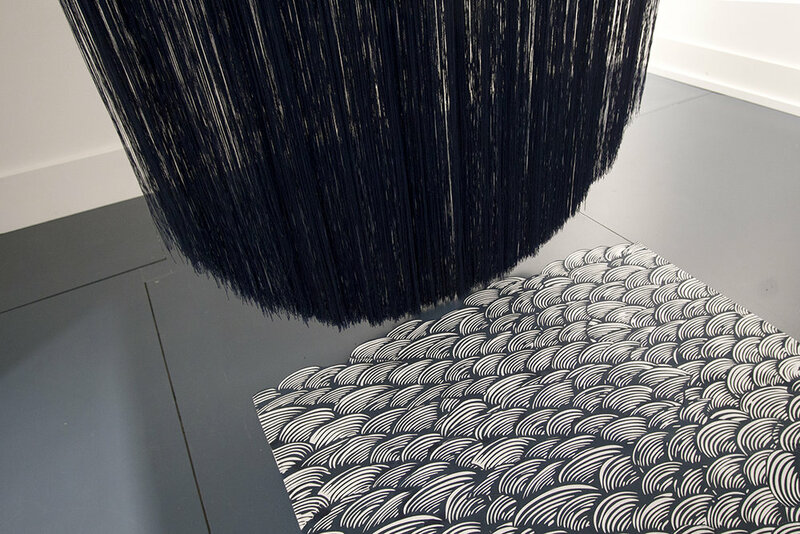 Ghosh received her MFA in Fiber from Cranbrook Academy of Art and her BFA in Fabric Design from the University of Georgia. She is currently Associate Professor and Program Coordinator of Fibres & Material Practices at Concordia University.